Europe's Golden Euro Casino is celebrating Chinese New Year a little early next week with 20 free spins on a new game from RTG . Join the celebration of the Year of the Pig with the launch of Pig Winner, a new Chinese-themed slot game from Realtime Gaming. 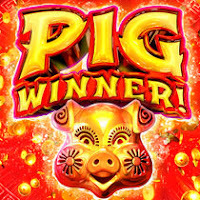 Filled with fun and fortune and 243 ways to win, Pig Winner has grouped Wilds that double the payout for any combo they're part of. On the second and forth reels they expand to cover their entire reel and create more possibilities for wins. Three Yin Yang Scatters trigger 8 free games with insane retriggers. After the 8th free spin, all free spin pay outs are tripled. "Here in Europe we may be a long way from Beijing and Shanghai," said Golden Euro manager Adrian Berger. "But wherever you are, it's hard not to get caught up in the excitement of Chinese New Year!" Golden Euro adds Pig Winner to their extensive collection of feature-packed Chinese-themed games including Plentiful Treasure, Gods of Nature, Shanghai Nights, Eagle Shadow Fist and the brand-new Wu Zetian, a lavish tribute to the Golden Age empress unveiled just last month. Until the end of February, Golden Euro Casino is doubling your deposits and including free spins on the new Pig Winner game.